Pinning down cellist Steven Isserlis's many-faceted musical personality is a bit like trying to grasp the secret of the wonderful varnishes of Cremona's master violin makers. You can't help thinking about Isserlis's warm, vibrant sound, his impeccable phrasing, and his flamboyant yet deeply introspective interpretations--all part of the mix, as are his great scholarship, his instinct for tracking down new works, and his passionate defence of the treasures he has unearthed. His musical personality is also informed by his close ties with musician friends, a determination to surmount life's obstacles, his many extra-musical interests, his friendly warm voice, and a fine-tuned sense of humour. He shares all of these elements with us in his recitals, recordings, and writing. 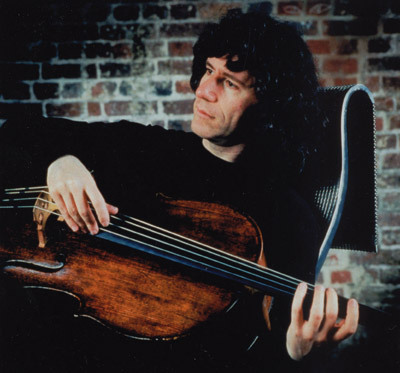 Isserlis's zigzag career has little in common with the meteoric rise of competition winners. Despite having a composer-pianist grandfather, a pianist mother, a violinist sister, and another sister who plays the viola, as well as a genealogy that includes ancestors of Felix Mendelssohn and Karl Marx, British-born Isserlis has risen to his present renown by a series of steps, even though he knew he wanted to become a cellist from a very young age. His first teacher, Jane Cowall, took her approach from cellist Emanuel Feuermann and musicologist Donald Tovey and cultivated her reputation as a both an eminent teacher and an eccentric. The seventeen-year-old Isserlis dreamed of studying with Gregor Piatigorsky in Los Angeles, but the distinguished Russian-born cellist died that same summer. At the one and only competition Isserlis ever entered he met David Waterman, cellist with the Endellion Quartet, who advised him to go to Oberlin. This he did, remaining for two years studying under Richard Kapuczinsky. After his American sojourn, Isserlis returned to Britain and waited eleven years for the phone to ring. It seemed as though his dream of a musician's life was impossible. "In my twenties, I didn't think I was going to make it," says Isserlis, who spoke to us from his London home. Despite some occasional concerts at English music clubs his career just couldn't seem to take off. However, through meeting other musicians (such as Joshua Bell, now a long-time close friend) and word of mouth, he finally found himself in the spotlight in his thirties. Since then he's hardly had time to draw breath. Isserlis is sought after by prestigious orchestras and the most highly respected conductors, as well as by the most desirable festivals. In 1993 he received both the Piatigorsky and the Royal Philharmonic prizes. "I was a late bloomer," laughs Isserlis, now forty-two, adding with rueful humour, "I could well make my d�but somewhere at the age of ninety-five!" Isserlis chooses his programs carefully. He admits having a strong predilection for programs around a theme, like the one focussed on the French repertoire that he'll be presenting in Montreal. Asked to describe his ideal recital program, he suggests a culinary parallel: "It's just like ordering a meal in a restaurant. You need the right combination of dishes.You have to choose the courses so that there's not too much rich food, although of course you want some. You also want something light to balance heavy dishes. I think the experience becomes more satisfying if you see an idea behind the recital programs." This is why Isserlis is so fond of presenting series (a Saint-Sa�ns series is planned for next year), and why he takes part in festivals or explores the music of a composer and his circle of friends, teachers and prot�g�s. Isserlis's enthusiasm for unearthing works is contagious. When he discovers a new work for the cello, he always lets the public know. "I can't play only Beethoven or Brahms sonatas, even if they are at the centre of my repertoire," he explains. "It's very exciting to play something that hasn't been heard for a hundred years. I'm thrilled to look at the manuscript, to bring the Sleeping Beauty to life. I think that much of the once-popular cello repertoire is no longer so--including the Saint-Sa�ns sonata that I'll be playing in my Montreal recital. And yet it has the intensity, the integrity, the good writing, deep feeling, and magnificent melodies that I like to find in a musical work." When Isserlis begins to explore one of these buried treasures, however, his approach is very pragmatic. "I sit down at the piano and get to know the score. Then I finger it on the cello. However, to really understand a complex contemporary work I generally have to play it several times with an orchestra, although basically it's always the same routine: the more I play the work, the more I'll feel at home." His interpretations have found an enthusiastic fan in British composer John Tavener, who has offered Isserlis several works. The cellist tries to include one or two new compositions each year, not having more time to explore in depth what may be tomorrow's classics. He regularly receives contemporary scores, but some just sit on his bookshelves, he admits, because they are impossible to decipher. "You can't get an idea of what some contemporary scores are about simply by reading them," says Isserlis. "When I discover a work by a composer from the past, by contrast, I know that if I invest the time to learn it, it'll be worth the trouble. If I don't like it, that's my loss. For example, for years I didn't like Faur�'s first sonata. Faur� himself liked it, he worked on it, published it, and was proud of the work. I spent a long time looking at it and ended up falling in love with it. Those composers were far greater musicians than I'll ever be." When Steven Isserlis gets carried away by something, he seems inexhaustible, glosses over faults, and is fervently enthusiastic. "With a composer like Faur�, whom I adore [and whose second sonata he will perform in Montreal], it would be torture for me to close one of his scores and admit that I didn't like it." Another of his great loves is Robert Schumann (in 2000 Isserlis won the Schumann Prize at Zwickau, the composer's birthplace). When you ask him whether he is still an admirer of Clara Wieck's ardent lover, his voice melts. "Yes, that love gets stronger all the time. Schumann is a wonderful, romantic package, a manufacturer of dreams. As a child I used to read his letters and I fell under his spell." Isserlis is an energetic champion of Schumann's late works, which he feels are wrongly ignored by the public. "Perhaps it's because I'm British," he says, "but my sympathy goes out immediately to the underdog. I don't understand how people can be rude about the Schumann of later years. I usually get my protective instincts up." Unloved composers are not the only subjects to trigger Isserlis's wrath. "There are far too many interpretations that are clich�s," he says. "When I hear errors of rhythm continually at the same place in Elgar's concerto, for example, it can be a bother, especially when it's spread worldwide!" After visiting Canada, Isserlis will spend a few days in Cornwall trying to open the ears of some ten young musicians. "I'm certainly no 'doctor'--someone who can help a pupil with specific physical problems," he notes. "My greatest teaching point is probably to try to eliminate clich�s. The musicians can then examine the piece as though for the first time and understand what the composer really wrote, rather than reproducing a recorded version. Why go to see a vicar when you can go directly to God? There's no reason why a third party should interfer in your interpretation!" "Big sound" is another of Isserlis's bugbears (he uses catgut strings, partly for the more intimate effect). "Big sound has nothing to do with good technique. If an actor stood upstage and began shouting his lines, I think the audience might be impressed, but ..." He pauses, leaving the rest to our imagination. "I believe there's a lot of this in music now." Like Schumann and Saint-Sa�ns, two of his pet composers (see insert), Steven Isserlis is an avid reader and a popular author. 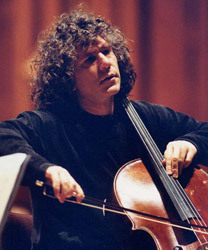 In addition to the liner notes for his CDs, he has written articles, some of which can be read on his extensive website, www.stevenisserlis.com. He has also published a work for cello, narrator, and piano, The Haunted House, and a book for children, Why Beethoven Threw the Stew, the life stories of six composers--Bach, Mozart, Beethoven, Schumann, Brahms, and Stravinsky. "When I was a little boy I was fascinated by composers' lives," he says. "I felt that the great composers were my friends. That's why I decided to pass on this love to my son and other children." Hailed by critics and young readers alike, this book may have a sequel if Isserlis's busy timetable permits. eating : "Good food's at the top of my list. I love pasta, Indian and Thai cuisine, spicy dishes. I adore chicken and, fortunately, I like salads." a well-mixed margarita, especially when prepared by his better half. What does he like most about music? That's like asking me what I like best about breathing! I need it! I could live without music, but I'd very much prefer not to have to. I listen to and think about music all day." crossover music: "I have no sympathy for a recording industry that offers musical wallpaper for yuppies and tries to pass it off as classical music. People need great music."